Kemer is a small resort town 43 km to the south-west of Antalya airport in a picturesque place between the tops of steep mountain massif Taurus and turquoise waters of the Mediterranean Sea. Kemer landscapes are incredibly picturesque. Here you can find beautiful mountains, rising to the sky and the sea with crystal clear water and emerald green forests with relict coniferous trees. There are several origins of the name Kemer and the city itself. First mention about Kemer is in the “Iliad” by Homer about Chimera, fire-breathing monster with the body of a goat, tail of a dragon and lion’s head, living in these places. And that is why the place was called Kemer. According to another story mountain streams had formed a village with tiny marshy lakes called “Old village”. The villagers built a 23 – kilometer stone wall to prevent the water flow. The walls were like a belt, that the Turkish means “kemer”. This village was subsequently named Kemer. The ruins of ancient cities around Kemer – Olympos and Phaselis, based in the 3rd century AD show the rich historical heritage of the region. Till present days there remain numerous stone tombs with intricate carvings, bath complex, which is a classical example of ancient Roman baths, ancient dam and the ruins of Hadrian’s gate. Today Kemer become one of the most popular tourist centers in Turkey, established as a tourist project in South Antalya. There are also casinos in Antalya like the Antalya Dedeman Hotel & Grand Casino and the Falez Hotel & Casino, where you can spend your money and to make that dream holiday complete. Design of the city has been carefully designed to be compatible with the surrounding landscape that creates an ideal atmosphere for a wonderful holiday. Construction in this area is limited since the region was scheduled to become a national park. To preserve the natural beauty, height of buildings should not exceed 2.5 storeys. These factors will strongly influence the value of property in the future, which in turn makes the return on investment in this region particularly impressive. The resort area of Kemer is famous for its great variety of landscapes: mountain ranges covered with thick vegetation, pine forests, approached the coastline, cozy quiet coves, beautiful sand and pebble beaches and the crystal clear sea of striking beauty. This is a real paradise for diving lovers and for the true connoisseurs of the sea depths’ beauty. Kemer Port is completely equipped with all the necessary in order that yacht-fanciers could fully enjoy the view of untouched bays and beaches. And in the vicinity of Kemer is a small rustic village of Cirali, with its total relaxation, the paradise for lovers of peace and silence. There are all the amenities for tourists in Kemer. You can get into Kemer from Antalya airport just for one hour. An extensive network of routs allows you to reach quickly any destination point. 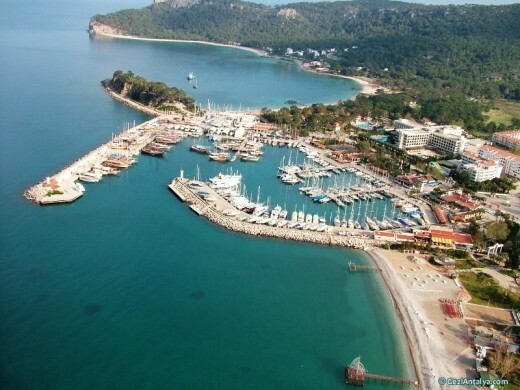 Investments in the tourism industry played an important role in the economy of Kemer. The city is a graphic example of urbanization. This cozy and quiet place for resting with developed infrastructure, an organized system of conveyance, communication and functioning municipality. Kemer is known in different countries and occupies an important place in the tourism industry. Kemer is very important economic object for Turkish Republic, located on the Turkish Riviera, the Mediterranean coast. Construction of a ski center gives an opportunity to ski in the mountains and swim in the Mediterranean Sea in the same season. Funicular railway stretches to 4350 meters and is the second longest in the world. Swimming, skiing, golf, sailing, mountain safari, mountain biking, horse riding, quad bikes, water sports – all these presents an excellent opportunity for healthy and proper rest. For those who likes the night city life a huge selection of entertainment can be presented. Numerous places are working all over the night and give vivid entertainment programs, nightclub’s and disco’s shows do not give to the guests of the resort to be bored. And there are a lot of small comfortable restaurants in Kemer that offer to taste the delicacies of Turkish cuisine. The resort area of Kemer includes such centers as Beldibi, Goynuk, Kemer, Kiris, Chamyuva, Tekirova, each of which is unique and has its own beauty. This resort is considered to be one of the most beautiful and memorable. Kemer is so picturesque place on the planet! The clean mountain air, palm trees, warm Mediterranean sea, the sun 300 days a year – all this does not leave people indifferent. Kemer inspires the desire to live and love the beauty of nature. A light sea breeze, the magnificent sunset in the evening and the sparkling sea in the morning, a quiet flutter of leaves and twitter of local birds are the bliss of heaven, created by nature itself. This paradise can be your home!